I grow a lot of peppers and the birds know it. I have doves and cardinals pecking the seeds out of the starting trays and the bulbuls, and mejiros picking and swallowing the peppers whole. They especially love the Hawaiian (Tabasco) peppers. Anybody else have this problem and how do you get around it. I did try bird netting on the tomatoes. Kept the birds out, but then the slugs ate the tomatoes instead. I tried netting the peppers, but the birds went under the netting to get to the peppers and then I had problems when the peppers and tomatoes grew through the netting. Not to mention, how hard it made it for me to get to the fruit. Don't have these specific problems but -- a while ago there was a query about keeping birds away on THG forum and one solution that was suggested was to run strings/wires in criss cross above where you don't want the birds to land. It's not meant to be a netting with holes that are too small for the birds to get through. The idea is that the strings/wires which should be slippery and too thin for them to perch on becomes flight hazard and the birds will avoid the area. Just around when this suggestion was made, I had gone down to the shore (New Jersey lingo for going to the beach) and ate at a food court where there were thin highly visible white cables or maybe heavy test fishing lines strung all over in random fashion over the open air sit down eating area to keep the seagulls away. That's an idea. I have tried putting cassette tape around the garden. The sound was supposed to deter them. But after they get used to it and know it does not hurt them, they ignore it. My bigger peppers are not in jeopardy since they don't try to go after anaheims, or habaneros. They will go for the Jalapenos when they are ripe, but not when they are green. But putting a barrier above the plant to prevent landing is at least worth a try. I have bamboo stakes that are long enough and I can get fishing line from the store so I'll give it a go. The mejiro may come from below but the bulbuls probably can't do that. P.S. Both of these birds are alien species. Finches can deter the bulbuls but the mejiro will even attack cats. Both of these birds love to eat papaya and peppers. Hi, I think a frame covered with chicken wire, something you can lift off, or if you build a heavy or long frame, make it so you can open the top or sides or both. For a single plant or two, a small box frame that can be lifted off. I have kept birds out of newly sown lettuce by employing a toy cat. It may not work for the bulbuls but it works for sparrows. My technique was to partially hide the toy and to move it often. It would sometimes be hiding under the rhubarb leaves, sometimes in a cardboard box that I set out, sometimes peaking around the corner of the carport. Sneaky cat! I moved it, at least, twice a day and the birds could never see the cat, clearly. The toy cat proved to be "off-putting" for the sparrows. Unfortunately my cats are in the house. I guess sparrows like lettuce. Bulbuls like peppers and tomatoes. People around here use pie pans and CD's tied to trees and the eaves to ward off birds. Does that work for anybody? I'm glad you reminded me. A pick your own farm in the area hangs those giant yellow inflatables with big eyes printed on them in their orchards. I was thinking of doing the pie pans but paint eyes on them first. It looks like they are hung just above the trees canopy. My dad and step mom have had pretty good luck with plastic snakes. She will go buy them from the dollar store and put them throughout the yard. Helps with squirrels too! Oh that's interesting! One year my MIL sent DH home with 1/2 dozen plastic and rubber snakes -- pretty realistic looking too. He did say she thought I should put them in the veg garden and apple trees, but the kids were little at the time -- 3-6 maybe? -- and those TOY snakes never made it out to the garden. Did you see the birdscare my kids made? 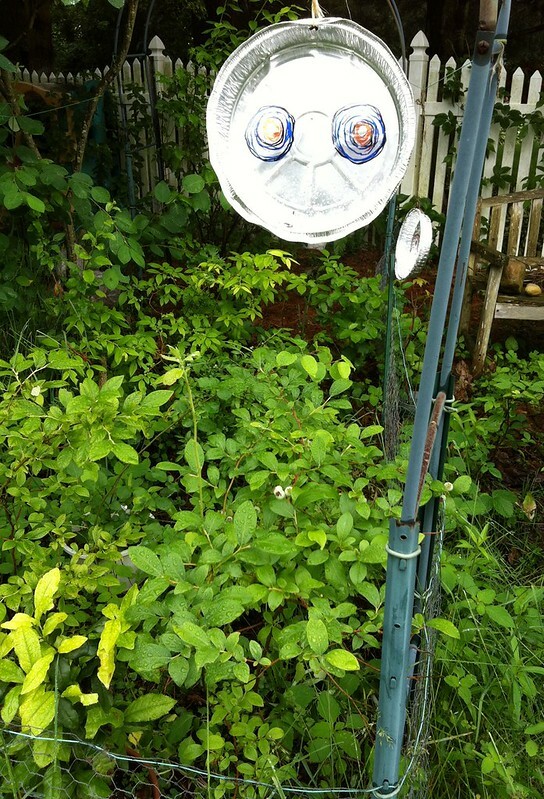 It seems to be working to protect the blueberries so far. We have a small area, 20' X 30' that we have covered with plastic netting, that works well. We ran 2 heaver wire strand across first to keep the netting from sagging. What's eating my Thai peppers?